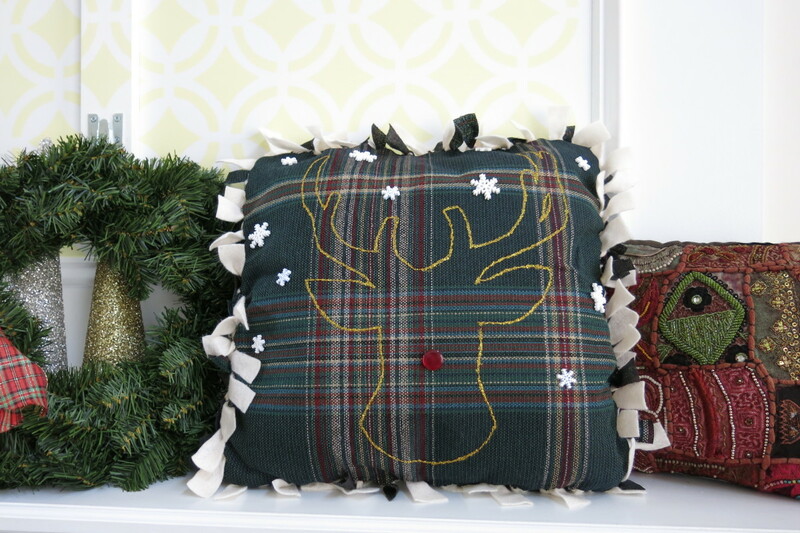 This no-sew pillow project is an easy way to add some holiday cheer to your seasonal decorating. This Christmas craft uses two pieces of fabric held together with ties, some paint, and some glitter glue, with just a few more embellishments. I've included different ideas on how to decorate each side of your pillow, but you can decorate only one side if you choose. 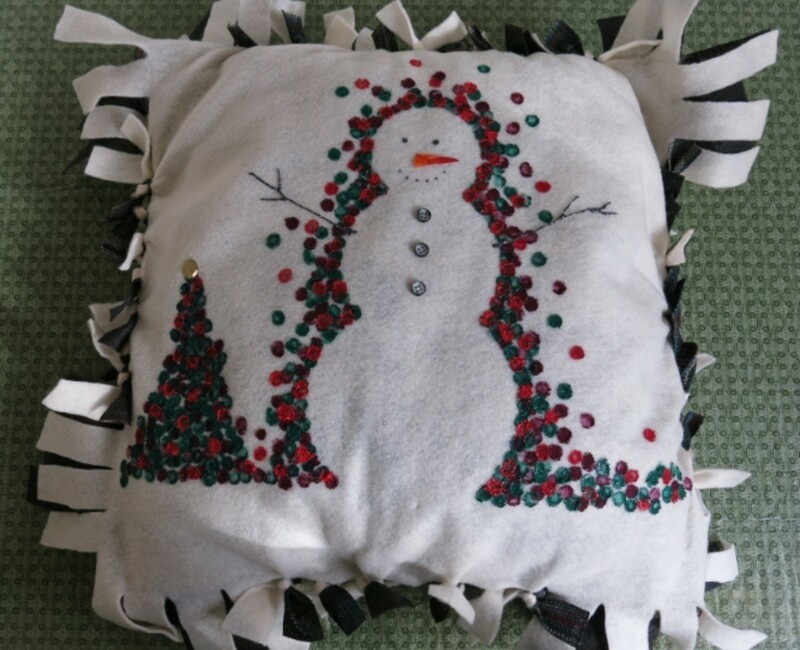 This pillow cover can also be removed after the winter holidays, so you can use it to give a festive look to your everyday pillows. 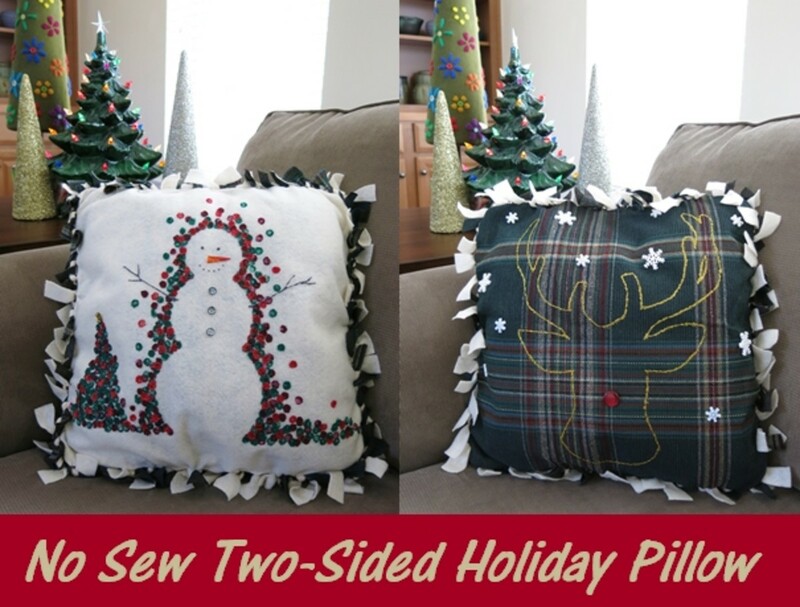 You can even use this basic project idea to make pillow covers for other holidays and seasons too! pillow form or insert - you can use either a basic pillow form or insert from the craft store, or you can use a decorative pillow that you already have on hand. I used the pillows that came with my sofa. two pieces of fabric - preferably felt that will not fray when cut. You can use the same fabric on the front and back, or use different colors. Amount will depend on the size of your pillow (see below). I used a plaid fabric for one side of my pillow, but this fabric had stabilizer already adhered to it. 1. 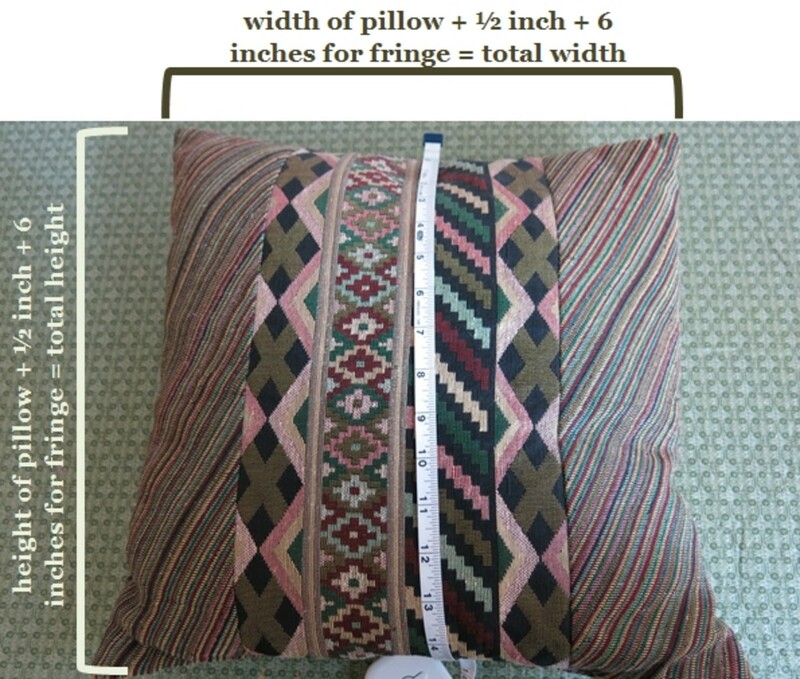 The first step in making your holiday pillow is to measure your pillow insert. Measure from the top seam to the bottom seam for the height of your pillow, and the left seam to the right seam for the width of your pillow. To each of these measurements, add a 1/2 of an inch for some leeway and 6 additional inches for your fringe ties (3 inches of fringe on each side of your fabric). These calculations will give you the total height and width that you need to cut your fabric (see diagram above). 2. Cut two pieces of fabric (one for the front of your pillow and one for the back) according to your calculations, making sure that your sides are square to one another. 3. Next, begin to cut the fringe ties for your pillow. With your material face down, measure in 3 inches on each side of your fabric. (Three inches may seem long for your ties, but a lot of length will be taken up by knotting the fabric). Then double-check that the resulting inside square is the height and width of your pillow form plus a 1/2 inch. I made each fringe tie about an inch wide. Measure along your inside square, marking each one inch increment. Make sure you mark off the same number of fringe pieces on each side of your fabric. Then use sharp scissors to cut your three inch fringe pieces. You can discard the corner pieces. 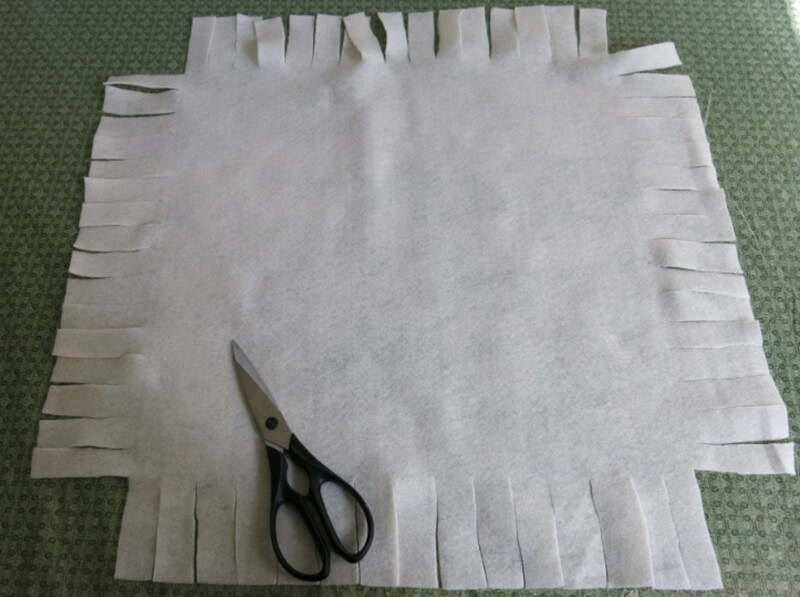 Cut the fringe on both pieces of your fabric. 1. 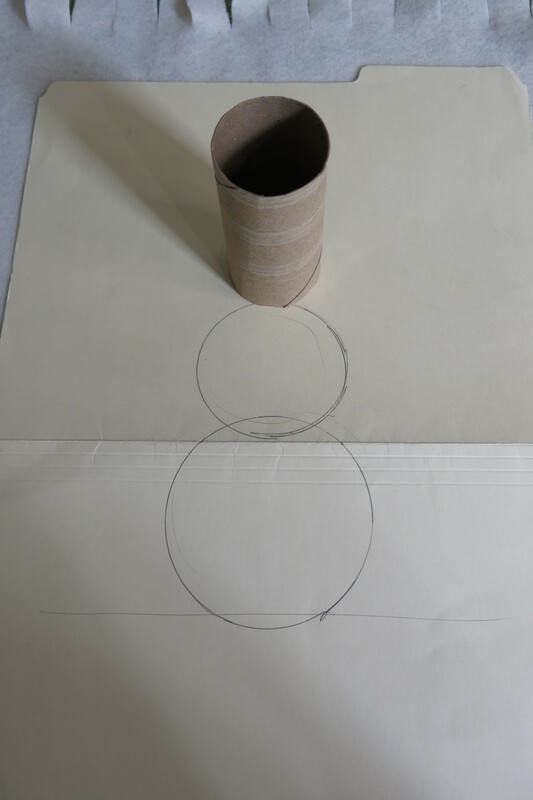 Using a piece of cardboard or poster board, trace three round objects from your home to create the outline of a snowman on your board. Use scissors to cut out your snowman shape. 2. 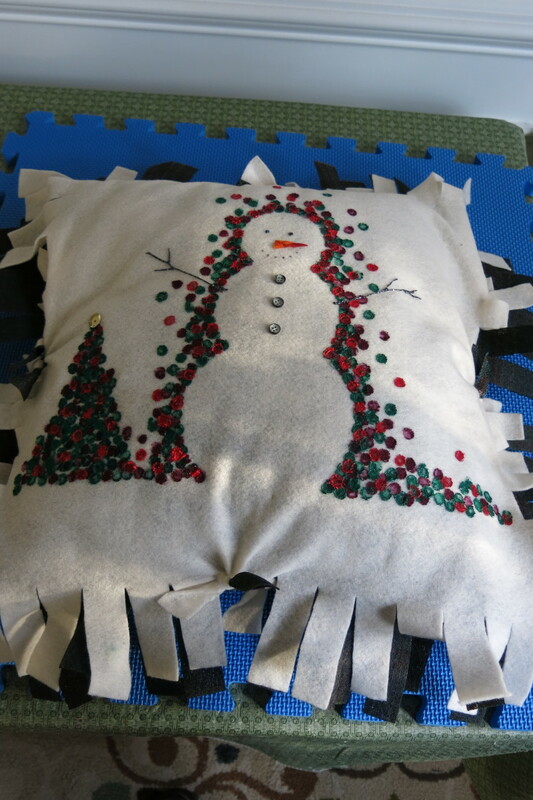 Lay your front pillow fabric face up on your work surface and pin your snowman shape to your fabric. 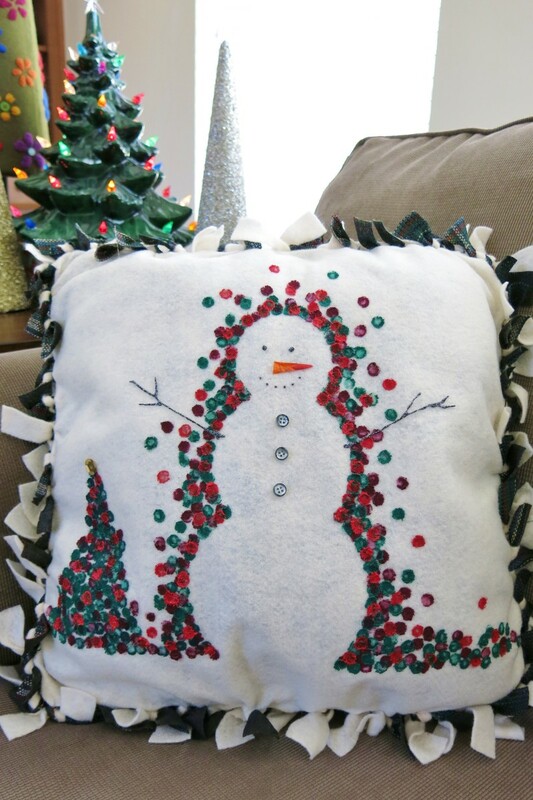 I put my snowman in the center of my fabric, but left enough room on one side to add a small Christmas tree. 3. 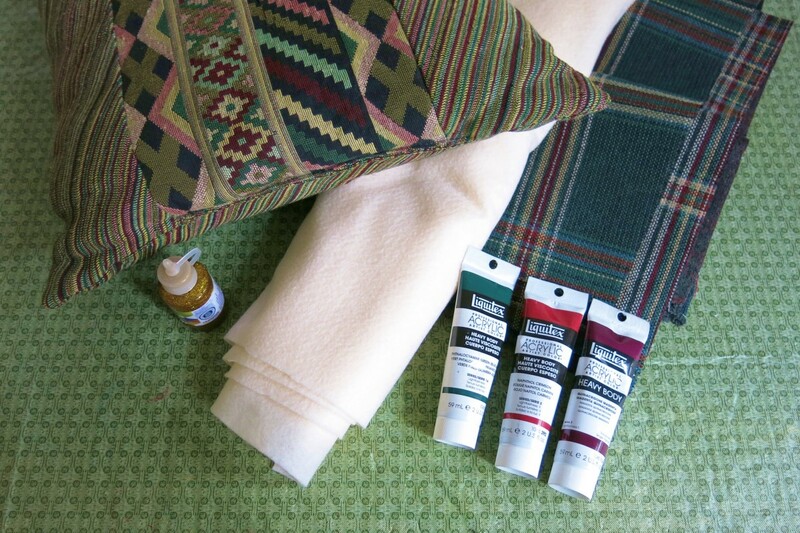 Mix up three colors of acrylic paint that coordinate with your pillow and design. I used a dark burgundy, a deep green, and red to match the plaid fabric I used on the back of my pillow. 4. Taking your unused pencil eraser, dip it into your darkest color of paint and begin to make a series of dots around your snowman template. As you dot the fabric with paint, twist your eraser to make a full and round dot. You may want to practice on paper first before dotting your fabric. You can add other shapes to your design using the paint and eraser if you wish. 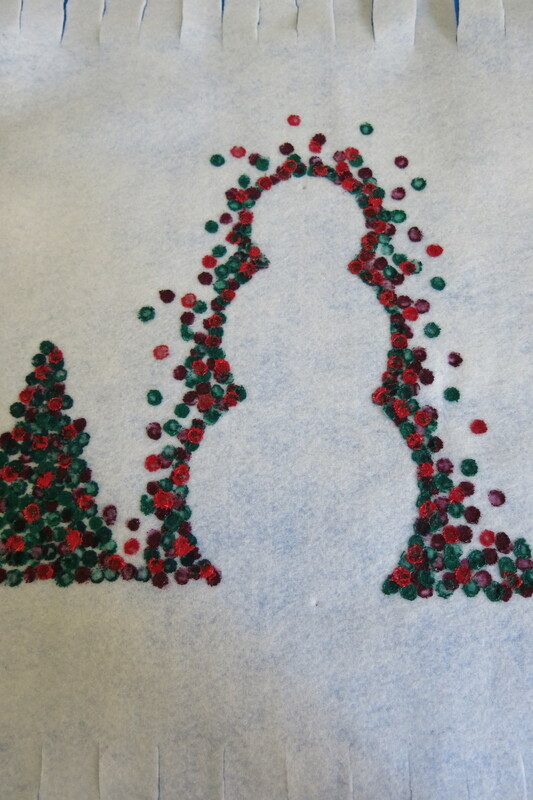 I used the same dots and colors to build a Christmas tree and foreground area for my snowman. When done, wipe your eraser clean with a paper towel before changing colors. Let your first layer of paint dry before moving on to your next color. 5. Repeat Step 4 using your medium color and your brightest color. With each layer, you will want to use fewer dots so that you create a pattern of color. 6. 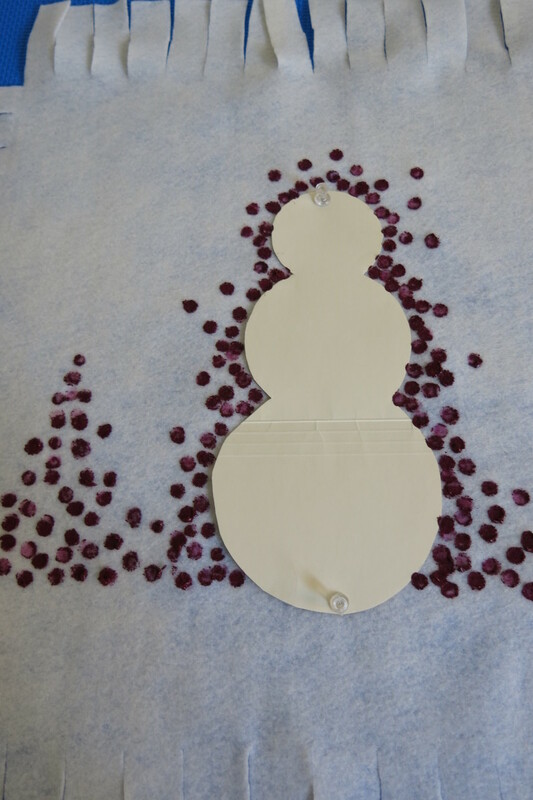 When all your paint layers are dry, gently remove your snowman stencil. You may need to add a few dots to make your design complete. 7. 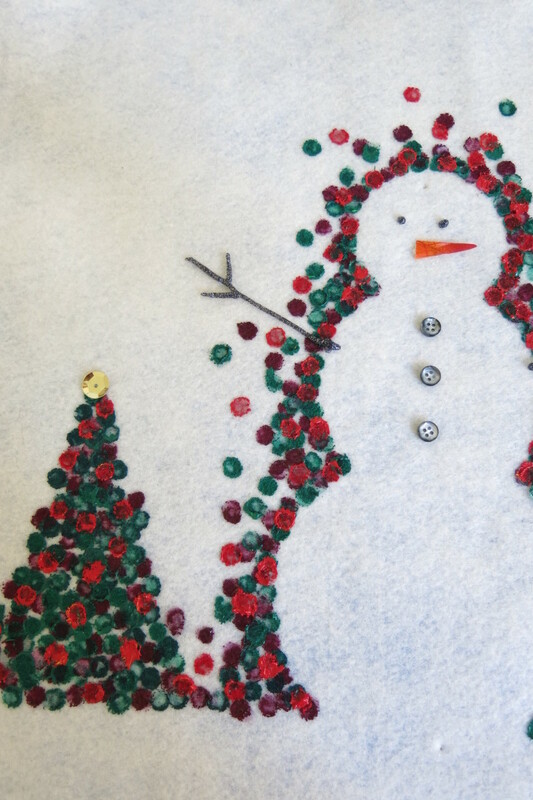 Use glitter glue or a fine sharpie to carefully draw some arms, eyes, and a mouth on your snowman. 8. Cut a small triangle of some fabric or paper (I used a small piece of Halloween ribbon) to make a carrot nose for your snowman. Use white glue or fabric glue to stick the nose in place. 9. You can dress your snowman as you choose. I glued three buttons to the front of my guy for decoration. You could add a top hat using black paint or glitter glue. Or use a scrap of fabric or ribbon to give him a scarf. 1. Using the basic instructions above, cut your fabric and fringe ties as described. 2. Look for a reindeer outline or silhouette in a pattern book or online. Use a copier or scanner to resize your image to fit on your pillow. 3. Cut out your reindeer head. Place your fabric face up on your work surface and pin your template to your fabric. Then use a marker to trace your reindeer shape on to your material. 4. 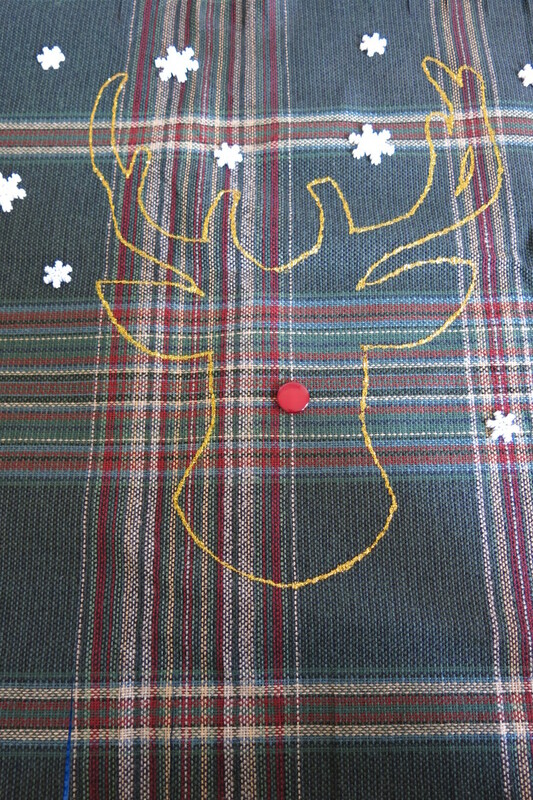 Use gold glitter glue or a paint marker to carefully trace the design of your reindeer onto your fabric. Then let your glitter glue or paint dry completely, preferably overnight. 5. 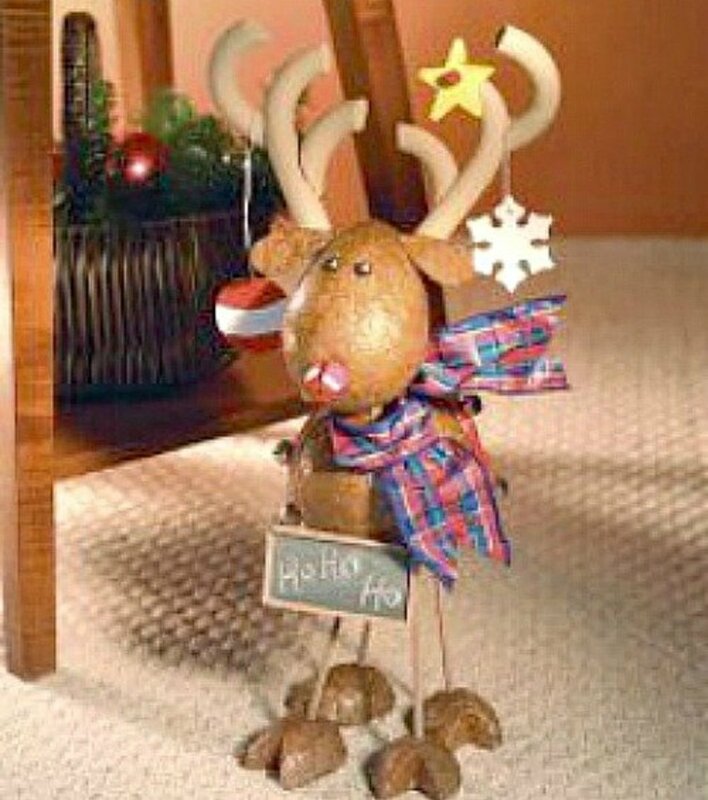 Glue on a red button for your reindeer nose and any other embellishments you wish. I had these little plastic snowflakes that I added to my background, but you could use an assortment of white buttons instead. 1. Let both pieces of your pillow cover dry completely. Then put one piece of your pillow fabric face down on your work surface. Place your pillow insert in the center of your fabric. 2. Put the other side of your pillow fabric face up on top of your pillow insert. 3. On the top edge of your pillow fabric, count the number of fringe pieces you have. Take the center fringe piece from your top fabric and tie it in a knot with the same center piece on your bottom layer. Do the same thing with your fringe ties on the bottom edge, and left and right sides. 4. Knotting a few ties on each side and moving towards the corners, continue to attach the front and back of your pillow together. As you tie your pieces, pull them tight to keep your fabric from wrinkling. 5. When all your pieces are tied together, you can trim your fringe pieces if you want. Copyright © 2015 by Donna Herron. All rights reserved. Looking for more holiday and decorating ideas? 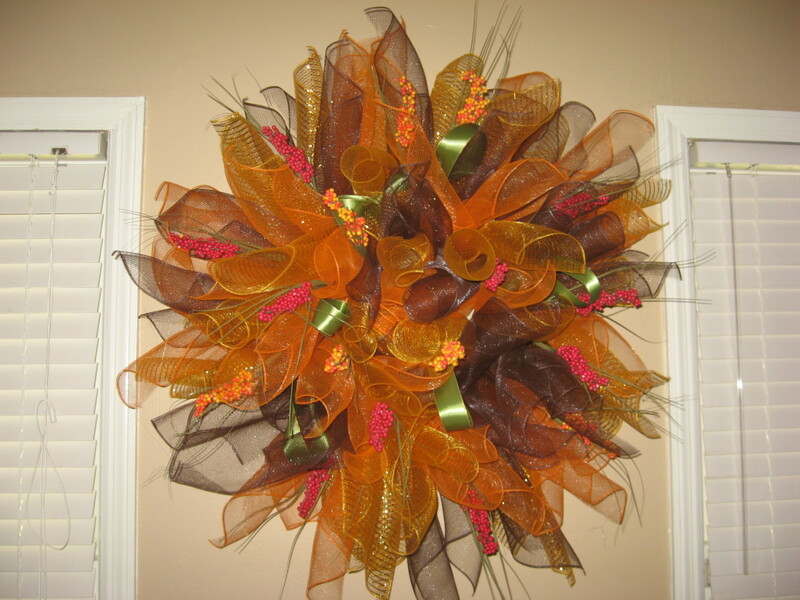 Check out my other holiday craft projects and tutorials! Thanks, Sally! It was a great surprise. Best wishes to you! Hi Kailua-KonaGirl - Thanks so much for your congratulations and comments. I appreciate your pin and shares. Thanks again! Hi easylearningweb - My father-in-law gave us that vintage ceramic Christmas tree. I love it too. I was made by my husband's grandmother, so it's extra special. Thanks so much for stopping by and commenting! Best wishes to you in 2016! Congrats on winning the Editors Choice monthly cash prize for this one. Fabulous every season pillowcase idea! Congrats on the Editors Choice and I can clearly see why. You have created a well-defined craft project with wonderful photos. I so love the idea of making cases to change out for every season. I am pinning to one of my DIY "no sew" boards. Very cool and easy, Donna! And I like your ceramic tree in background in the snowman pillow picture. Hi teaches12345! So glad you like this project! If you have the fabric on hand, this can be a pretty quick project. Good luck! Hope you have a wonderful holiday and a happy new year! Very pretty designs! It is too late for me this year but perhaps if I start early -- I can do one for next Christmas. Hi Randi - I don't really sew either (though I wish I did). That's what so great about this holiday project! Thanks so much for reading and commenting! I appreciate it! Those are awesome. I dont sew but I love no sew projects. Great! So glad you like this project and tutorial. Thanks so much for your comments! This is brilliant. You have opened me to other possibilities around no-sew pillows. Thanks, Kristy, for your kind comments! I appreciate you stopping by and commenting! Nicely elaborated, Donna! A great idea for all the creative minds to give their home decoration a personalised touch this Christmas. Hi Sally - Thanks so much! As always, I appreciate your comments and support! Thanks, Chantelle! So glad you like this pillow project. Thank you for your kind comments! Very cute and definitely do-able - great for people who don't own a sewing machine and even a creative possibility for children with a little supervision. Absolutely adorable. Such a great idea!